Many schools are moving away from celebrating holidays with food in the classroom. 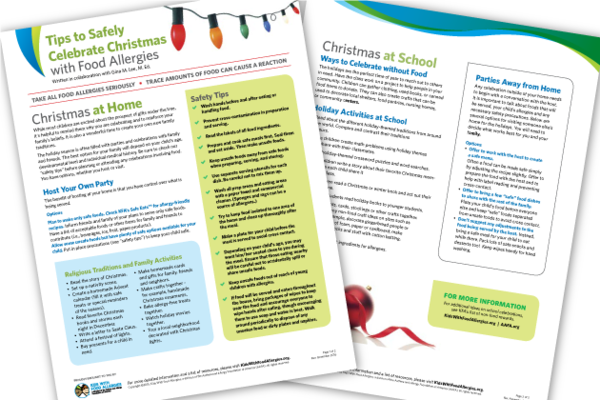 If your school chooses to celebrate the winter holidays, partner with key school staff and families to plan holiday festivities that are safer and more inclusive for everyone, including kids with food allergies. Share our Teal Classroom™ Kit with your child's teacher. This kit has resources to help to raise food allergy awareness in the classroom. The holidays are often centered around food, but there are many other traditions that can become the focus. Read about the different holiday-themed traditions from around the world. Compare and contrast their traditions to your own. Solve holiday-themed crossword puzzles and word searches. Play games that come from other holiday traditions. Learn how to say "Happy Holidays," "Merry Christmas" or other holiday greetings in different languages. Have children write a story about their favorite holiday memory. Have each child share it with the class. Have children read a holiday or winter-themed book and act out their favorite part of the story. Partner with another class to have older students read holiday books to younger students. The holidays are also the perfect time of year to reach out to others in need. Suggest the class work on a project to help people in your community. Collect clothing, used books or canned food items to donate. Create crafts that can be used to decorate local shelters, food pantries, nursing homes or community centers. Make ornaments, cards, stockings or other crafts together. For example, decorate gingerbread people or houses made out of foam, paper or cardboard; make snowmen out of white socks and stuff with batting. Be sure to check craft ingredients for allergens. Make puppets of the characters in a holiday or winter-themed story. Use them to put on a puppet show for another class. It's tradition to give gifts at the holidays. This can be a token from the teacher to the students or a class gift exchange. Encourage non-food gifts. Share KFA's Non-Food Rewards at School handout with teachers. This handout has ideas that can be used as a "gift" to the class, as well as ideas for small non-food gifts that could be given individually to each student. If there will be a class gift exchange, encourage the teacher to specify that only non-food items should be given. This information should be clearly communicated to both students and parents. Share these ideas or download and share our holiday tips handout with teachers and others who are planning activities. Support Kids With Food Allergies (KFA) so we can continue to bring you these educational resources. Use our affiliated Amazon shopping link and up to 10% of your purchase will go to KFA. Shop through www.amazon.com/?tag=kidswithfooda-20 on your favorite computer or mobile browser. Please note that using the Amazon app on your phone or tablet will not include this code. You must use a browser for the code to work. If you only shop through the app, you can set up Amazon Smile to support KFA.